​Among my love for progressive rock, one of my other favorite genre’s is musical theatre. Here’s me covering “Stranger Than You Dreamt It” from POTO. It’s a bit of a deeper cut from the show, but by far, my most favorite song from the musical. Tuesday, October 30th marks the 6 year birthday of my concept album CONVERSATION PIECES. Well whilst cleaning out the cobwebs of my old hard drive I happened upon a commentary I did back in June of 2012. ​I had intended to include this recording with the albums bonus items on Bandcamp, alas it was forgotten about and forever lost in the digital void of my hard drive. In this commentary, I dig deep into the albums plot, lyrical details and talk about all of the amazing musicians that helped me out on this project. If you’re familiar with the type of music I create, then you may have noticed a trend of artists and music that are on the heavier more progressive side of music. 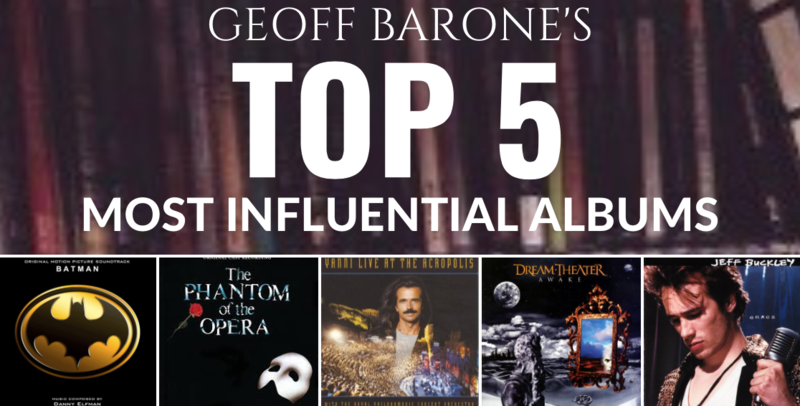 ​Well, believe it or not, the top 5 artists that I consider instrumental to kick starting my music career or had a dramatic effect on the way I write, are not who you think they would be….well that’s not entirely true, but there are a couple artists that you may look at and say “Really Geoff? I thought you were all about shred and prog and crazy music”…no. It didn’t always start out that way.